John Vermiglio is Detroit born, Providence schooled, and Chicago trained. His first restaurant job was in a bagel joint at 14, where he washed dishes instead of rolling dough and baking bagels. His big chance came when he accepted a position as head chef of Charlie Trotter’s catering company, Trotter’s To Go. Vermiglio spent two-plus years learning, catering events and private dinners, and eventually working at the group’s two-star Michelin flagship. After moving from one Chicago lion to the next, Vermiglio decided it was time to come home to Detroit. 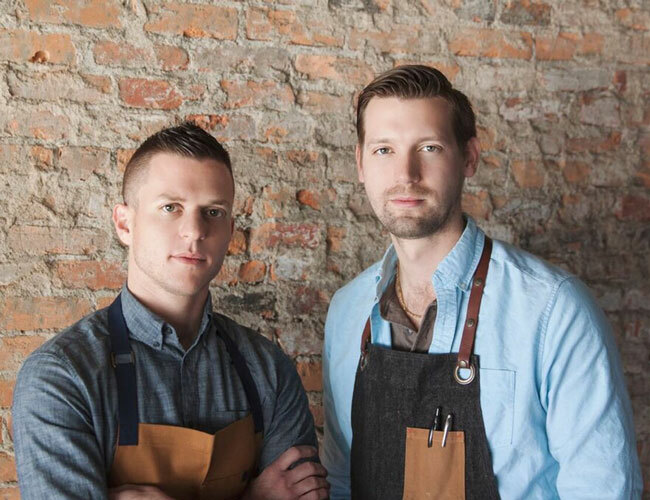 In summer 2016, he opened casual, fun, cocktail-centric Grey Ghost in Brush Park. Josef Giacomino originally discovered his passion for cooking when he was twelve in his hometown of Madison, Wisconsin, and received his professional training from Le Cordon Bleu Cooking & Hospitality Institute of Chicago. He has served as chef de cuisine of Quince Restaurant in Evanston and Jam Restaurant in Chicago, and as executive chef of A10 Hyde Park, which he guided toward a Michelin Bib Gourmand Recognition, among numerous other awards. Giacomino currently serves as the co‐executive chef at Grey Ghost Detroit, in charge of menu creation, ordering, staffing and general operations for the food programs. John: Senior year of high school, after watching a mini-series on students going through culinary school. I realized cooking was the medium I was looking for in the art world. Joe: Freshman year of college after realizing my college football career was over due to a serious injury. I sought outside activities to fill the void and cooking was exactly what I needed. John: Eggs Benedict. It’s a versatile and complex dish that can be served any number of ways. Joe: Shrimp DeJonghe, a specialty of Chicago. It’s a casserole made with whole shrimp, and who doesn’t love casseroles! John: Ham and cheese sandwich. John: I ate a 100-year-old egg in culinary school. It wasn’t good, but it was an unforgettable experience. Joe: Au Pied de Cochon in Montreal. It was a feast for the senses, an awesome experience. John: The people. They are some of the most proud, tough, loyal citizens of any city. Joe: The history. Since moving to Detroit a few years back, it has been fascinating to learn and absorb all of the rich history this city has experienced.